Five years ago, when Sarasota Audubon launched its capital campaign for a Nature Center at the Celery Fields, “building green was in the DNA of the plan,” a news release says. “Starting with a modest budget and working with Carlson Studio Architecture [of Sarasota], the organization “committed to building to the basic level of LEED [certification],” the release adds. 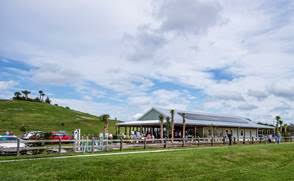 Just days after the facility’s grand opening in early January, the local Audubon chapter received word that the U.S. Green Building Council had awarded the approximately 2,600-square-foot Nature Center enough points to receive the LEED Gold category, the third highest rating, the release points out. “We integrated as many green features as we could to make the building healthier for the members and visitors who would come here, and the bird and wildlife habitat that surrounds us,” said Jeanne Dubi, president of Sarasota Audubon, in the release. “LEED (Leadership in Energy and Environmental Design), is an international, sustainable-design feature rating system,” the release explains. Points were awarded to the Nature Center in a number of categories, including those related to materials and resources, water and energy efficiencies, indoor environmental quality, and innovation in design, the release continues. A grant from the Selby Foundation allowed the organization to install 42 solar panels, which provide almost all the energy needed to operate the facility, the release adds. “Educational materials about the numerous green features are on display at the Nature Center and on the chapter website at sarasotaaudubon.org,” the release notes. The LEED Gold certification is one of several awards the Sarasota Audubon chapter has received over the past several months, the release says. The Conservation Foundation of the Gulf Coast named Sarasota Audubon its 2015 Partner of the Year. Additionally, at the annual Assembly of Audubon chapters, Audubon Florida honored the organization as the 2015 Chapter of the Year; Dubi received the 2015 Leadership Award, the release adds. The Nature Center is located at 999 Center Road, at the intersection of Palmer Boulevard and Center Road in Sarasota. To find out more about the Sarasota Audubon, visit the website at www.sarasotaaudubon.org.